The information is either wrong, or does not represent the full range of variation for some characteristic of a given species (e.g., Ribes cereum). In addition, sometimes the plants we see have additional prominent features that are quite useful for identification that are not mentioned, such as prominent fragrance. Of course, floras also quickly become out of data as new taxa (e.g., Euphorbia terracina) are discovered in California, or taxa are found to not exist (e.g., Chenopodium incognitum). None of the above is unexpected from books that describe thousands of species in a very terse space-limited format. The published manuals in general are wonderful compilations of data, with extremely useful keys, descriptions and drawings of plants. These manuals have been extremely valuable in our identifications of plants, and we are deeply grateful for the vast amount of work that has gone into such books. Nothing on this page should detract from the tremendous accomplishment in such books! The Jepson Desert Manual: Vascular Plants of Southeastern California, B.G. Baldwin et al, eds., UC Press, 2002. The Jepson Manual: Higher Plants of California, J.C. Hickman, ed., Third printing with corrections, UC Press, 1996. A Flora of Southern California, P.A. Munz, UC Press, 1974. We also give comments, when appropriate, on the Flora of San Diego County, R. Mitchel Beauchamp, Sweetwater River Press, 1986. Most of the time, the key in Beauchamp follows that of Munz, and hence nearly all comments about the keys in Munz apply to Beauchamp as well. Occasionally, however, the keys diverge, such as for Eriogonum fasciculatum. The comments presented here may be of help to others who use these manuals. Note that both of us are self-trained botanists, and we do not have decades of experience with plants. Hence it is entirely possible that some of our comments may reflect a misunderstanding of some botanical terms, or some other mistake. If so, we would appreciate being informed of any corrections needed to our comments. However, our non-professional status also gives us two advantages. First, it allows us to look at the keys and descriptions from a fresh viewpoint. This allows us to recognize problems with keys and descriptions that might escape a professional who, for example, might unconsciously assume important unstated characteristics of a species that were used in making a key. Second, we are examining live specimens in the field, instead of dried herbarium specimens. The populations can be quite different in some cases. It is quite likely that the two of us have more extensive and more concentrated experience with using these two floras than anyone else. From the beginning of 2002 to October 2003, we have placed 5,624 occurrences of 1,209 taxa into our database from 68 trails in Southern California. We have keyed out nearly every one of those taxa, many of them multiple times. So in less than two years, we have used both floras thousands of times, and have a pretty good idea of when a key or description needs some corrections to properly identify live plants. the latest information on identification, taxonomy, distribution, ecology, relationships, and diversity of California vascular plants. The necessary scientific data to understand the basis for new plant names and explicit corrections and updates to The Jepson Manual will also be made available. This is an outstanding resource to find out the latest about any taxa in California. The site has excellent summary pages of New records and names for the California flora, including newly-described taxa and range extensions for the rest of the taxa, which as of December 2003 includes information about the non-native taxa as well as the native taxa. Unfortunately, no updated keys or descriptions of the new taxa are online. They have also put the JM treatments for each taxa online, and the keys for the species within each genus. The keys are the ones from the corrected third printing; they have not been updated using any of the revisions given elsewhere at the Interchange. To get the key for a genus, select the JM treatment for just the genus name, scroll to the bottom and click on the key retrieval link. Some treatments were updated in the JDM. Most of these corrections are online, including the flowering times. Many ranges have been expanded based on inspection of vouchers. Author citations have been corrected based on extensive literature research, and author abbreviations have been corrected to follow the standards set in Brummitt & Powell, Authors of Plant Names. The site also has a format to submit corrections or additional information about the California flora. Unfortunately, other than the summary pages mentioned above, we can't find a way to view a list of just those submissions, or get a list of corrections generated from those submissions, without clicking on each and every taxon name to see if there are any updates. If we have somehow missed this, we would appreciate feedback. For those with the first or second printings of the Jepson Manual, see Corrections To The Jepson Manual. That page also gives an address to report further corrections, but we have no knowledge of any online version that gives a similar summary of this information. Although we began this page in November 2001, we have been too busy botanizing to update this page with the hundreds of items we have found so far. We hope in winter 2003-2004 to put at least some of them online. The comments are organized by species in the same order of the Jepson Manual. The book to which the comments apply is identified by JDM, JM, Munz or Beauchamp. Beginning in May 2003, we began vouchering every specimen that was the source for each comment so that there was an archival record backing up each comment. (Before that time, we had considered our plant material to be too small to be a good voucher specimen, since we generally collect only the smallest amount of material necessarily to identify a specimen, aka the smallest identifiable unit. We finally realized that if we have collected enough for us to identify a specimen, it is enough for a voucher, even if it won't fill a herbarium sheet.) The vouchers are labeled with our voucher numbers until they are turned over to a herbarium, at which time they are labeled with the herbarium voucher numbers. Tom thanks Scott Gordon for making the high-quality plant press used to press these specimens. JM description, p. 286. Typo: the description says gen < 300 mm; it should be gen < 300 m.
The distribution is also incomplete; at minimum, SW should be added, since it is found all over the SW CA-FP. See, for example, the many records reported in Calflora. We have observed this species many places in SnGb at lower elevations in the front range, in the PR at the Santa Rosa Plateau and Santa Margarita Ecological Reserve in western Riverside County; and Fallbrook in northwest San Diego County. JM key and description, pp. 294-295. Munz key and description, p. 181. Distinguishing var. menziesii from var. vernonioides seems problematic using either the Munz key or the JM key. We have never had any success in using either key in obtaining good identifications. Instead, in nearly every group of plants we have seen, there are specimens that key out to each of these varieties. Hence we observe no geographic separation of the species. For example, in Crystal Cove State Park, which supposedly only has var. vernonioides of these two, we have observed perfect examples of var. menziesii in close association with perfect examples of var. vernonioides. This does not necessarily mean that the two varieties are indistinguishable, although that certainly could be the case. It simply means that the existing keys are not good discriminants of these varieties. Of course, this could also be an indication that these two varieties are indeed often not distinguishable, and therefore the varieties are not valid. Furthermore, this is one of those interesting situations where the Munz key and descriptions apparently contradict the JM key, and the JM key and descriptions apparently contradict the Munz key! In order to review the contradictions, we reproduce here the key information from each flora. Note that the JM has combined Haplopappus venutus ssp. furfuraceus and ssp. oxyphyllus into Isocoma menziesii var. menziesii. Hence the main discrimination between the two Isocoma varieties is the couplet in bold above. The Munz description for H. venutus ssp. furfuraceus (I. menziesii var. menziesii): shrubby, sts 3-5 dm long; herbage glabrous, lvs crowded, narrow, linear to linear-spatulate, entire or with a few minute teeth near apex, with prominent fascicles in the axils, mostly glabrous, sometimes woolly.- dry sandy mesas; CSS; s. San Diego County. The Munz description for H. venutus ssp. oxyphyllus (I. menziesii var. menziesii): robust shrub 1-2 m high, loosely villous to glabrate; lvs. oblanceolate to narrowly spatulate, acute or acuminate, entire; cymes openly paniculate.- common in San Diego area. The Munz description for H. venutus ssp. vernonioides (I. menziesii var. vernonioides: 4-12 dm high, the stems usually simple below the infl. ; lvs spatulate-oblong, spinulose-dentate to almost lobed; heads in rounded terminal cymes.- CSS, Coastal Strand, Coastal Salt Marsh; San Diego n.
The JM description of the species is: LVS: entire or toothed. INFL: heads in loose to tight clusters. These quantities are not discussed further in the variety descriptions, implying that each variety has these ranges. The JM description of var. menziesii: Pls < 2 m. STS glabrous, scabrous or tomentose. LVS clustered in axils or not, linear to spoon-shaped, glabrous, scabrous or tomentose. Soils from sandstone or granite, landward side of dunes, hillsides, arroyos; < 1200 m.
The JM description of var. vernonioides: Pls < 1.2 m. STS glabrous or scabrous. LVS clustered in axils, obovate, ovate or oblong, glabrous or scabrous. Protected sites on dunes, lagoon shores, marshes; < 400 m.
The JM key relies primarily on the leaves being "gen not clustered in axils" for var. menziesii; the Munz description directly says that the lvs have "prominent fascicles in the axils" for one of the former subspecies that is now this variety. - the stem characteristics are useless for any specimen without a tomentose stem, since the JM description for both species includes both glabrous and scabrous possibilities. - We have seen lots of specimens of Isocoma menziesii, many of which have been classified as var. vernonioides by others, and have yet to see one with a stem obscured by the leaves. So that does not seem to be a useful discriminant. - We have seen plenty of green leaves on the supposed var. vernonioides, and hence this does not seem to be a good discriminant of the two varieties. (See the pictures at Calflora; also note that one of the common names for this variety is "green-leaved dune goldenbush"!) Furthermore, we have found that leaf colors are very difficult to use as discriminants for many species. One person's dark green is another person's gray-green. Hence the JM key does not seem to be a useful discriminant between the two varieties either. - The JM habitat for var. vernonioides is "Protected sites on dunes, lagoon shores, marshes"; the Munz habitat is much broader: "CSS, Coastal Strand, Coastal Salt Marsh". One specimen growing immediately next to the beach sand at Crystal Cove State Park in Orange County is quite instructive. The plant is 2 m tall, has mostly entire leaves, very few axillary leaves, the non-tomentose stem is easily visible, and the inflorescence is openly paniculate. This is a clear var. menziesii using either the Munz or JM key. However, the only variety on their plant list is vernonioides, the rest of the plants there fit the description of var. vernonioides, and this is the claimed habitat of var. vernonioides. All of these discrepancies are not the sign of two well-described, clearly-differentiated varieties. If anyone can inform us of a key that actually separates these varieties, and can account for the wide-ranging discrepancies between these floras, please let us know! We are deeply suspicious that the combining of varieties ought to go a step further and combine these two varieties as well. After all, it is curious that the JM combined a subspecies with height (from Munz) of 3-5 dm (furfuraceus) with a subspecies with height of 10-20 dm (oxyphyllus), but chose not to include another subspecies with height of 4-12 dm (vernonioides). This sounds to us like the continuous variation of a single subspecies whose height ranges from 3 to 20 dm, in accordance with the large overlap of other properties discussed above. After we wrote the above, we examined our vouchers of Isocoma menziesii collected from a single location at Monserate Mountain, Fallbrook, San Diego County, on 31 October 2003. There were about 30 or so separate plants within a circle with a diameter of perhaps 20 m.
Interestingly, some stems have leaves that are all entire; other stems have leaves that are all conspicuously dentate. Some lower stems look precisely like the JM illustration of var. menziesii, with almost no axillary leaves; other lower stems have significant clusters of axillary leaves. Finally, some inflorescences have many-flowered heads in compact cymes; others have few-flowered heads in open cymes. All of these traits seem to be the normal variation within every population of Isocoma menziesii that we have examined, and not evidence of distinct varieties. The Munz key is missing Stephanomeria diegensis, and hence anyone using the Munz key will either be confused or misclassify that taxon as Stephanomeria virgata. Furthermore, the height characteristic for S. exigua in the key, plants mostly below 5 dm high is wrong for the vast majority of the plants we've seen. See Stephanomeria exigua ssp. deanei for further information. The JM key couplet to discriminate S. diegensis and S. virgata from three subspecies of S. exigua has always confused us greatly. It uses the morphology of the inflorescence, along with the peduncle length, to separate them. We agree that both of these characteristics distinguish these taxa, but the key as stated in the JM is incorrect for the hundreds of plants we have observed in San Diego County and nearby. However, observed heads on S. diegensis and S. virgata are located either on the main stem at its nodes, or on the typically very-long ascending branches on their nodes. We have seen no specimens that have heads on short, stiffly-spreading branches. The heads we have seen are often entirely in clusters averaging ~4-5, with up to ~9, heads, with each head sessile or having its own peduncle attached directly to the node, without any short branches. See Stephanomeria diegensis for further information. Thus the plants we have observed bear no resemblance to the inflorescence structure described in the key for this taxon, nor do they resemble the JM drawing of S. virgata ssp. pleurocarpa, which has the same inflorescence description. Further, the JM drawings of S. virgata ssp. pleurocarpa and S. exigua ssp. exigua appear to have an identical inflorescence structure, despite the key discriminant. One explanation for this is that the JM drawing of S. virgata ssp. pleurocarpa is actually of a tall specimen of S. exigua (see Stephanomeria exigua ssp. deanei). However, if the specimen is correctly identified as S. virgata ssp. pleurocarpa, then apparently, the JM author calls similar-looking structures below each flower head short, stiffly-spreading branches for S. virgata ssp. pleurocarpa; but calls them peduncles for S. exigua ssp. exigua. 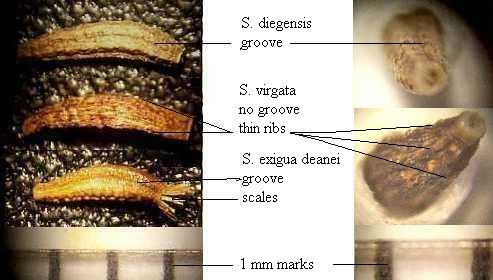 Moreover, we measure peduncle lengths of 0.5-2.0 mm in the JM drawing of S. exigua ssp. exigua, far different from the gen 10-40 mm of the key. We measure 3-13 mm in the JM drawing of S. virgata ssp. pleurocarpa for the similar structure, but the JM author must be calling those short branches of length 3-13 mm, with a sessile flower at its end. S. diegensis: mile 0.02 of the Vernal Pool Trail, Santa Rosa Plateau. Also see Wayne Armstrong's beautiful pix of the groove and pappus for S. diegensis, as well as the clustered flowers. He also shows another view of the same S. virgata and S. exigua achenes as pictured here. See below for further information on all these taxa, including a discussion of the plants in each locality. The JM key and description is incomplete in delineating the stem height, the stem branching properties, the number of grooves in the seed, the fruit length, and the number of flowers per head. Also, live specimens do not have the reflexed outer phyllaries of the JM key and description. Finally, element 16 should say frs 1.8-3.0 mm instead of frs 1.8-2.4 mm. In the JM description, it should possibly say outer phyllaries with tips not appressed instead of outer phyllaries reflexed. FLS should be 5-13, not 6-8. FR should be 1.8-3.0 mm, not 1.8-2.4 mm. See Stephanomeria diegensis for further information. Munz key and description, pp. 230-231. These floras both give a maximum height for S. exigua of 6 dm. Also, Munz states that the number of flowers per head for all subspecies of Stephanomeria exigua is mostly 5. The Jepson Manual gives the range as 5-6. Height. Our previous experience with S. exigua was that this species was indeed quite short, within the 2-6 dm range given in the floras. However, on 17 November 2003, on the Dripping Springs Trail, Agua Tibia Mountains, Palomar Range, in the PR, Tom was absolutely shocked to come across a number of specimens that ranged in height from 10 to 17 dm! We originally speculated that the summer rainfall received on that trail, along with the significant clearing and widening of the trail that occurred before this growing season, may have contributed to the extraordinary heights of these specimens. The area of the trail that had been cleared behaved as if it had been burned the prior year, with a robust growth of the usual post-burn annuals. We have vouchered a small portion of one of these plants, (tchester #265), and photographed this specimen with a scale in the picture. However, subsequently, Tom found two separate large populations of this taxon which had heights up to 18 dm, one at the Santa Margarita River in Fallbrook, and one at the Santa Rosa Plateau. There was nothing unusual about either of these locations, which received no summer rainfall that year. Hence we suspect that taller Stephanomeria exigua ssp. deanei plants have simply not been collected, perhaps due to a possible tendency for botanists to collect plants that will entirely fit on an herbarium sheet. For other speculations on the source of this discrepancy, see Stephanomeria exigua ssp. deanei. Number of flowers per head. The number of flowers per head is distinctly larger than that given in the floras, and is quite variable from plant to plant. From an analysis of 171 heads, Tom found that 2/3 of the heads have 5-6 flowers per head, with a full 1/3 having 7-8 flowers per head, with outliers up to 10 flowers per head. See Stephanomeria exigua ssp. deanei. Achene length. On the Dripping Springs Trail, Tom found a range of 2.2-3.0 mm, larger than the 2.0-2.5 mm given in the JM description (oddly, the JM key gives a more restricted range of 2.1-2.4 mm). See Stephanomeria exigua ssp. deanei. JM key and description, pp. 346-348. The existence of two separate subspecies for S. virgata seems questionable. Tom found no evidence to support the existence of two subspecies for S. virgata at Agua Tibia Mountain. The distribution of the number of flowers per head was uniform from 5 to 8, with no evidence of segregation into two subspecies with different numbers of flowers. Furthermore, it is easy to find examples online that contradict the claimed geographic locations of those two subspecies in other areas of California as well. See Stephanomeria virgata. JM description, p. 352. The description says heads gen 3- 6. In August 2002, on the Pacific Crest Trail between the Dawson Saddle Trail and Throop Peak Trail, we found 6-10 heads per stem. We found 1, 3, 4, 2 and 1 occurrences of 6, 7, 8, 9 and 10 heads per stem, respectively, from several different plants. JM description, p. 390. The description says calyx ± 2 mm. Munz description, p. 267. The description says calyx somewhat accrescent in age, ca. 2 mm long. Accrescent is defined in Munz as increasing in size with age, as often with the calyx after flowering. What actually happens with the size of the calyx is this: The first flowers to bloom on a given branch have a calyx length of 4 mm while they are in bloom (not 2 mm). The length of the calyx of succeeding flowers in bloom becomes smaller and smaller, until it reaches lengths of ~2 mm. We originally thought that the first popcorn flower blooming at the Vernal Pool at the Santa Rosa Plateau was another species since its observed calyx length was 4 mm, too long to fit the 2 mm given in both floras for this species. It was only when we had seeds that we found that our tentative id was incorrect due to this error in the floras. It is perfectly understandable how this error arose. Herbaria specimens are usually obtained when there are seeds from the first flowers and the latter flowers are in bloom. At that time, the flowers in bloom all have calyx ± 2 mm, and the oldest ones in seeds have a calyx of ~4 mm. the calyx gets larger as it goes to seed. Many plants do the latter, and hence whoever first "explained" this assumed that origin for the effect. However, live plants show that this assumption is not true for this species. Lepidium strictum is listed as a native to California in the JM, but the evidence seems overwhelming that Munz was correct and this is a taxon introduced from South America. Third, this taxon behaves exactly like a non-native in Southern California. It is found only in weedy areas, never in an undisturbed native habitat; and it is spreading into new areas. It is found in the Dripping Springs Campground, Agua Tibia Mountains, Palomar range, in an area next to the road and toilets, in the only location we know of that has all FOUR non-native Sisymbriums in one location within sight of each other. It has been found on a junior high school campus in Escondido, a mowed area with very heavily compacted soil. It is listed as a "scarce urban weed" in the Western Riverside County Checklist. the plants were found entirely in areas such as in, on, or around parking lots, trails, and graded areas. Strangely, I have NEVER, AT ALL found it in non-disturbed, native habitat. After all, how many natives have this JM description: "Uncommon. Disturbed sites, gen urban; < 300 m. CA to Oregon, Colorado"?? JM key and species descriptions, pp. 452-456. JDM key and species descriptions, pp. 242-244. Three chollas are omitted entirely from these keys, Opuntia acanthocarpa var. major, Opuntia ganderi, and Opuntia wigginsii. No mention at all is made of Opuntia acanthocarpa var. major in the descriptions. The other two are only briefly mentioned as possible hybrids in the JM, without any description. Oddly, Opuntia ganderi, a desert taxon, is entirely absent from the JDM since its entry was under a non-desert taxon. All three taxa have been restored as valid taxa in California by the JM editors at the Jepson Online Interchange as of 11 November 2003. Interestingly, the treatment for chollas has come virtually full circle. The currently-accepted taxa are equivalent to the ones recognized in Munz except for treating two varieties in Munz as a single species without varieties. See Chollas for a complete list of chollas, a synonymy table for their names and a distribution table, and an updated JM key that includes the taxa missing from the JM and the JDM. Apparently the taxon C. incognitum is no longer accepted, and plants formerly recognized as being that taxon are now either C. atrovirens or C. hians; see ITIS Report for C. incognitum. USDA PLANTS now places C. incognitum as a synonym under C. atrovirens and under C. hians. The ITIS source is John Kartesz, Biota of North America Project (BONAP), University of North Carolina. Tom keyed out a Chenopodium in the Laguna Mountains on 29 September 2003, found on a trip with a person who wishes to remain anonymous, that clearly keyed out to C. atrovirens (voucher Chester249), with the pericarp so free from the seed that the seeds were falling out of the pericarp on their own. (Every other Chenopodium sp. in the Cuyamaca and Laguna Mountains Flora has pericarp adherent to seed, except for C. californicum. C. californicum differs in two clear ways from the 29 September 2003 specimen, having vertical seeds (the specimen had horizontal seeds) and much different leaves.) C. atrovirens was not even in the latest San Diego County Checklist, so this was a bit surprising. Tom examined a subsequent collection of ~ten more plants from the Lagunas that had been submitted to the San Diego Natural History Museum Herbarium; SDNHMH, and they were all also clearly C. atrovirens, except for a single collection of C. berlandieri. Hence Tom suspected that these C. atrovirens plants in the Lagunas had formerly been misclassified as C. incognitum. In the process of tracking down this mystery, the anonymous person found this change in the USDA database. Tom went to the SDNHMH on 15 October 2003 in order to look at the C. incognitum vouchers for the Lagunas to see how different they were. Unfortunately, nearly all the C. incognitum vouchers for the Lagunas stored at SDNHMH are out on loan, so he was able only to examine one voucher. That specimen indeed has pericarp firmly attached to the seed, and hence is indeed different from the C. atrovirens Tom collected. That voucher does not look like the C. hians voucher Tom examined (it is lacking the long linear leaves), so it is not clear how that specimen will now be classified. Tom communicated this information to Dieter Wilken, the Jepson Manual author of this genus, who tracked down the source of this change. Dieter sent in a note to the Jepson Interchange on 14 October 2003, but it has not yet appeared online as of the time of this note, 19 October 2003. WARNING: this description was based on a single plant collected at Corral Canyon Loop Trail in Lower Corral Canyon, Santa Monica Mountains. Thus the range of the characteristics is surely larger than given above. Also, the identification of this plant has not been verified from a key, since we haven't yet found a key that includes this plant. If you know of one, please let us know. JM description, p. 678. The description says FR 10-12 mm. Munz description, p. 787. The description says berry ca. 6 mm in diam. In 2003, a normal-rainfall year, we measured diameters of 6-7 mm for berries on a plant on the PCT just below Throop Peak. We also measured a 6 mm red glandular fruit on the Aspen Grove / Fish Creek Trail in the San Bernardino Mountains. Thus the Munz description seems closer to what we find in Southern California, but we'll check again in a heavy-rainfall year. JM key and description, p. 693, 698. JDM key and description, pp. 343, 346. Munz key and description, pp. 503, 512. The major error here is that when P. minutiflora was subsumed into P. crenulata, the JM authors forgot to carry over its characteristics into the species description and into the Phacelia key. A secondary error is that some properties of P. crenulata itself and the var. minutiflora are not given correctly in the JM and JDM, even though they were given correctly in Munz. Finally, one of the most striking properties of at least var. minutiflora is not mentioned: the glands are translucent green balls! Probably the striking color of these glands fades in dried specimens. Munz says that the leaf blades of P. crenulata are pinnately divided or undulated lobed, and Tom found leaves that were pinnately lobed from a sample of var. minutiflora from Coyote Canyon, Anza-Borrego Desert State Park. Hence the JM and JDM description should be revised from just crenate to deeply lobed to crenate to pinnately divided. P. minutiflora has calyx lobes of 3-4 mm long in flower, as stated by Munz, which agrees with Tom's measurement of 4 mm, not the 2-3 mm long given in the JM key. Since Munz says the fruit is ~3 mm long, this means the calyx lobes can easily be at least 1 mm longer than the fruit, not the sepals ±= fr of the JM key. This makes the first part of the JM and JDM key useless as a discriminant. P. minutiflora has unequal calyx lobes. Munz says 1 or 2 wider than others. Tom observed widths of 1.0-1.2 mm for 3-4 calyx lobes in each flower, with 1-2 calyx lobes having a width of 2.0 mm. This makes it difficult to interpret the ± 1.5 mm of the JM and JDM key, and even more difficult to compare to the ± 1 mm width of P. amabilis. The corolla length for P. minutiflora in Munz are 4-5 mm, and Tom measured a corolla length of 6 mm for the Coyote Canyon sample. Hence the JM and JDM description for var. minutiflora should say corolla 4-6 mm, not just ± 4 mm. This also makes the Munz key problematic in separating P. minutiflora from P. crenulata, which is support for folding these two species into a single species. Finally, the scales for var. minutiflora are not linear, as stated in the JM and JDM key. The adjective used in the description is narrow, which is closer to the oblong / narrowly obtriangular scales observed by Tom, and the rectangular to lunate description in Munz. The stamen lengths for P. minutiflora in Munz are 3-4 mm, but Tom measured 4-6 mm for the Coyote Canyon sample. Hence the JM and JDM description for the species should say stamens 4-6 mm or 10-15 mm, not just 10-15 mm, to include the assimilation of P. minutiflora into P. crenulata. Similarly, the style length for Tom's sample was 6 mm (Munz does not state a length). Hence the JM and JDM description for the species should say style ±6 mm or 12-15 mm, not just 12-15 mm. The fruit is not glandular, as given in the JM and JDM keys. The descriptions in all three floras state that the fruit is puberulent, which agrees with Tom's observation. A similar revision should be made to couplets 16 through 18 in the JDM key. Munz description (Zauschneria sp. ), pp. 616-617. We have found that determining a subspecies for specimens of this species is problematic in the San Gabriel Mountains at higher elevations. This is probably because the two ssp. intergrade in Southern California, as reported in the JM. ssp. canum: lvs gen grayish, linear to lanceolate (2-5 mm wide), often clustered, rarely glandular; per to ss 2-9 dm. ssp. latifolium: lvs gen green, widely lanceolate to ovate (7-17 mm wide), lateral veins obscure, gen glandular; per 1-5 dm. The fundamental discriminants in both keys are the width of the leaves and the presence of a woody stem base for some specimens of canum. We have observed a number of plants at Dawson Saddle, Throop Peak, the Big Horn Mine Trail and Lightning Ridge Nature Trail, in 2001 and 2002, at elevations of 6000 to 9000 feet (1800 to 2700 m). The most telling is a single specimen at Dawson Saddle (7903 feet, 2400 m elevation) with two sets of leaves on it. The leaves near the base are very large and broadly ovate, and those near the flowering tip are linear-lanceolate, with an abrupt change between the two kinds of leaves. In 2003, on plants within a few miles of this one near Throop Peak, we observed only large and broadly ovate leaves near the flowering tip, with the largest 25 mm long x 14 mm wide. Thus the width of the leaves in the higher elevation San Gabriel Mountains seems to depend on moisture conditions, with 2001 being considerably wetter than the severe drought year 2002 and producing the wider leaves. Presumably, at these higher elevations we should only have found ssp. latifolium. Munz reports that in Southern California ssp. canum is generally found only below 2000 feet (600 m) elevation, and JM raised this to only 5000 feet (1500 m). Yet in 2002, many of our specimens there would key out as ssp. canum, with maximum leaf widths less than 6 mm and a woody base. For example, we observed ~ten plants on the southeast slope of Throop Peak at an elevation of ~9000 feet (2700 m) that clearly key to ssp. canum, not ssp. latifolium. The stems are woody are base, and leaves are grayish-green, narrowly lanceolate (20 x 5-6 mm for the largest leaves), and clustered in the axils. Their only latifolium characteristics are shorter stems (1.0 dm) and the presence of glands on the leaves (from visual observation, but not producing any stickiness). The discrepancy with the latifolium identification is even larger if we use the reported varieties of latifolium reported in Munz. In other areas, the plants cannot key out to a specific ssp. For example, at Lightning Ridge (~7500 feet), we observed plants with a woody base but whose leaves were 7-8 mm wide. In the Munz key, the branch is at a width of 6 mm, so these plants have latifolium leaves but a canum stem. Other properties seem variable, too. At Lamel Spring at Mount Baden-Powell, some of the leaves are green and some gray-green on the same plants. For these reasons, we have decided not to attempt to discriminate the ssp. at the higher elevations of the San Gabriel Mountains. It remains to be seen whether other areas of Southern California have reliable and stable ssp. We look forward to someday finding some pure latifolium plants with "herbaceous stems 1-3 dm", "herbage more viscid", and "green, often silky" leaves that are at the wider end of the "7-17 mm wide" range. Wayne Armstrong and Tom found problems with all of these keys for plants of E. parishii and E. minutiflora from plants in the Anza-Borrego Desert State Park in the vicinity of Borrego Springs. First, every E. parishii that we came across had 3-ternate leaves, not the mostly 4-times ternate leaves of the Munz key. Hence such plants cannot be keyed properly in Munz, which is probably why Curtis Clark removed this as a distinguishing characteristic in the JM. The leaves of the numerous specimens of E. parishii were all glaucous, not bright-green or yellow-green, making this key distinction useless for plants in this vicinity. Curtis suggests that there may still be a difference in how deeply glaucous the leaves are, and our samples from March 2003 do seem to show such a difference. Of course, you need to have the leaves from both species side by side to discern the difference. The widening of the leaf segments toward the tip was not a reliable separator. We found specimens of E. minutiflora that were not widened toward the tip, and specimens of E. parishii that were. The length of the leaf segments was not a reliable separator. The JM key says lf segments < 2 mm for E. minutiflora. We measured a mean of 3.5 mm, and a full range of 2.0 to 5.0 mm, for the ultimate leaf segments on each ternate division on a randomly-selected leaf sample. These are the shortest leaf segments on the leaf; if we had included leaf segments other than the terminal ones, the numbers would have been significantly larger, up to 9.0 mm. The basic problem here is that it was recognized post-Munz that a population of E. minutiflora plants in the El Paso and Rand mountains of the west Mojave, with large flowers, had been masquerading as E. parishii specimens. Thus Curtis Clark had a very difficult job to try to use non-flowering characters to distinguish species that appeared so similar that some specimens from one species were mistaken for the other species. We communicated our findings to Curtis Clark, and he told us that this key failure was caused because Curtis had not seen specimens like ours. Seeing the full range of variation in a species is difficult for any botanist, due primarily to limitations in the number of specimens available for examination. Curtis also commented that E. parishii seems to consist of several races that are not necessarily interfertile, that may be reflected in variable morphology. An example of this might be the leaf color variation for E. parishii between the DMoj and DSon. This would replace couplet 4 in the JDM and couplet 8 in the JM. Curtis suggests that revising this couplet to leave out the petal length will work in the DMoj. We thank Curtis for his help in understanding this interesting genus, and for reviewing the above information for accuracy. For much more extensive information about Eschscholzia, see the beautiful pages of Curtis Clark. The varieties fasciculatum and foliolosum are defined differently in Munz and JM. As a result, botanists may key the same specimens to different varieties, depending on whether they use Munz or JM. This is especially true if one uses the key in Beauchamp, in his Flora of San Diego County. In the JM key, both varieties are under Lf subglabrous above, although the JM description for var. foliolosum says sometimes thinly tomentose above. In Munz, the leaves are glabrate above for var. fasciculatum and pubescent above for var. foliolosum. This led Beauchamp, in his Flora of San Diego County, to use only the hairiness of the upper leaf to distinguish these two varieties. In contrast, the JM key uses the hairiness of the involucre and perianth to distinguish them, as well as whether the plants are decumbent or not. Thus botanists using Beauchamp will key many specimens of var. foliolosum (sensu JM) as var. fasciculatum. Botanists using Munz, who encounter specimens with glabrate leaves but pubescent involucres and perianths will have a dilemma as to which variety fits their specimens. We have encountered many such specimens, and clearly the JM treatment deals with these specimens much better. The JM also restricts var. fasciculatum to CCo below 400 m, whereas Munz has this variety from Santa Barbara to n. L. California. Beauchamp has this variety all the way inland in San Diego County to Bonsall, Poway, Ramona and Campo. Clearly, there is a strong difference of opinion about what these varieties are, and hence once must be careful to know what criterion are being used to define them. A distinct advantage of the JM key is that it removes the need to call many specimens "intermediates". For example, the Santa Monica Mountains Flora uses calyces and upper surface of lvs glabrous for var. fasciculatum; calyces and upper surface of lvs evenly pubescent for var. foliosum. As a result, they find: intermediates are common. The JM criterion would place the intermediates with hairy calyces and glabrous upper surfaces of leaves firmly into var. foliolosum. (Specimens with glabrous calyces and hairy upper surfaces of leaves would still be intermediates, if they exist. So far, we have not seen any specimens like that, despite looking at hundreds of plants in many different locations in Southern California). In 2004, we finally encountered three specimens from three different locations that would be classified as var. fasciculatum (sensu JM, except for the plant being prostrate). These plants were at Saddle Peak in the Santa Monica Mountains, Monserate Mountain in Fallbrook, San Diego County, and Laurel Canyon, Laguna Coast Wilderness Park, Orange County. In contrast, 38 of our trails have var. foliolosum, with pubescent involucres and perianths. This includes considerable searching for var. fasciculatum at Torrey Pines and Crystal Cove State Park. After studying these plants, and because of all the weasel words (gen, ±) in the JM descriptions and key, we primarily key on the involucre hairiness to separate these two varieties. If the leaf is glabrous above and the involucre is glabrous, we key such plants to var. fasciculatum, even if the perianths are a bit hairy outside, due to the perianth ± glabrous in the JM description for that variety. If the involucre is hairy, we key such plants to var. foliolosum. So far, whenever we have seen a hairy involucre, the leaf upper surface and perianth has also been hairy. Ceanothus tomentosus var. olivaceus cannot be keyed using any of these keys. It is especially odd that the keys of Munz and Beauchamp do not treat this taxon properly, since this is the only form in Southern California! Only the SN variety keys properly. As a result, these keys give Ceanothus oliganthus as the identification for samples of Ceanothus tomentosus var. olivaceus. Thus in the PR, and perhaps in nearby areas, one must further discriminate all specimens that key out to Ceanothus oliganthus. Fortunately, the JM author, Clifford Schmidt, has an online key that works for var. olivaceus. with the JM key couplet 14 following 13'. Ceanothus oliganthus: plant often tree-like; lvs 0.8-3.9 x 0.4-2.5 cm, petiole 3-8 mm, blade always 3-ribbed from base. Ceanothus tomentosus var. olivaceus: plant not tree-like; lvs 1.2-2.6 x 0.6-1.3 cm, petiole 4-5 mm, blade gen 3-ribbed from base, rarely 1-ribbed. We would have called the lower blades bluish-gray-green for a specimen at Blue Sky Ecological Reserve Ceanothus tomentosus var. olivaceus, but that is close to gray-green. In general, Ceanothus tomentosus var. olivaceus is more common at lower elevations near the coast, whereas Ceanothus oliganthus is more common at higher elevations. However, there is considerable overlap in their distributions. JM Key and description, pp. 940, 942. Munz Key and description, pp. 738-739. There are significant discrepancies between the Munz and JM keys and descriptions, which may be indicative that R. pilosa is not a separate species. 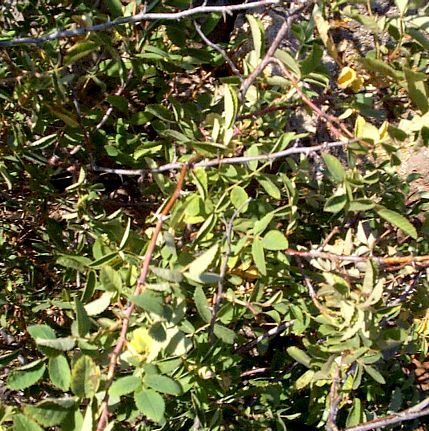 Furthermore, Tom has documented plants at the Santa Margarita Ecological Reserve in southwest Riverside County that have the same properties as the putative R. pilosa, but which are most likely normal R. ilicifolia. See Rhamnus ilicifolia and R. pilosa for more information. William R. Hewlett, 12 December. James C. Turner, 17 October. Our observations include 18 November 2001 at the Santa Margarita Ecological Reserve, and 24 June 2002 at the Santa Rosa Plateau. The latter plant is a planting at the Adobes, and illustrates nicely the change in contrast with age of the stem. Young stems show prickles with a high contrast, which gradually fade with time. In the latter image, compare the prickles on the middle-age stem in the middle to lower left of the photograph to the horizontal old gray stems at the top and middle. Barbara Ertter, the person who wrote the key in Jepson, has updated the key, and put a beautiful treatment online with pictures. She "volunteered" to write that key with less than a month to do so, in "the dead of winter". As a result, she could only study herbarium samples with dried stems. The red color resulting from anthocyanin is water soluble and would disappear when dried. This understandable mistake should in no way detract from Ertter's impressive treatment, which included a brave revision to the current treatments of Rosa, and have apparently passed the test of time so far. JM description, p. 1005.. The description says fls gen < 4. This description is correct, and gave us a chance to determine, in this case, what the word gen meant. Tom histogrammed the number of flowers per inflorescence on 63 plants on the Granite Loop Trail at the Santa Rosa Plateau on 10/20/01, 11/3/01, 11/26/01, and 12/15/01, with help from Kay Madore on one of those trips. The histogram shows that 73% of the inflorescences had fewer than four flowers. The largest number of flowers per inflorescence was a single inflorescence with seven flowers. Hence, at least in this case, gen means 73% of the time, which seems quite reasonable to us, being significantly over 50% of the time. By the way, the JM illustration shows an inflorescence with four flowers. Please note that we are just having a little fun here, and no disrespect is intended at all toward the author of this treatment. In fact, we appreciate very much the addition of the number of flowers to the description, since that is a useful piece of information. Furthermore, the use of the word gen seems perfectly appropriate here. Munz made no mention of the number of flowers. Like many others, we overinterpreted the word generally when we first began to key plants out, as being something like 90% of the time or so. However, the dictionary defines generally as with respect to the larger part, and hence simply refers to any trait shown by more than 50% of the specimens. JM description, p. 1022, and illustration, p. 1025.. The description says INFL bracts 15-35 mm, bright red to yellowish. This is true only for the bracts of the upper flowers in an inflorescence, at least for specimens of Castilleja miniata ssp. miniata at mile 1.9 on the Devils Slide Trail of San Jacinto Mountain. Each of the ~four individual plants at that location have a bract for the lowermost flower that is green throughout, ovate and only 8 mm long. The bracts increase in length upward in the inflorescence. The second bract is ~10 mm long, ovate and is green throughout; the third bract is ~12 mm long, linear/lanceolate and is red on its upper half. The fourth bract is ~18 mm long, mostly red and its shape finally corresponds to the bract of the JM illustration. This difference caused some concern about the identification of these specimens, since Tom brought home the lowermost flowers from two different stems, and both bracts disagreed violently with the JM description for this species. This concern was only resolved by a repeat trip to discover how the bracts changed along the inflorescence. JM description, pp. 1018, 1020..
Plants in the San Bernardino Mountains which key to Castilleja applegatei ssp. martinii are apparently the taxon C. martinii var. ewanii as described in Munz. The JM description does not include some of the characteristics of these plants, especially those of the leaf. Instead, the JM calls this taxon a hybrid of Castilleja applegatei ssp. martinii with C. angustifolia, which is listed as a judgement-reserved taxon under Castilleja applegatei ssp. martinii. The taxon name C. martinii var. 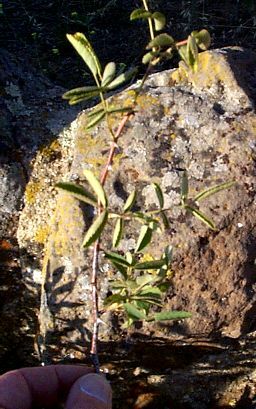 ewanii has apparently been reassigned as a synonym for C. angustifolia, a distinctly different taxon, and thus no longer corresponds to these plants in the San Bernardino Mountains. See Comments on Castilleja applegatei ssp. martinii from the Plant Trail Guide to the Aspen Grove / Fish Creek Trail, San Bernardino Mountains. JM family key, p. 1168. Munz family key, p. 918. 1a. Plant body with 1 - several roots. 2b. Roots 2 - 12. 1b. Plant body without roots. The new genus Landoltia contains a single species, Landoltia punctata, formerly Spirodela punctata. For an extensive key and guide to the Lemnaceae family, with beautiful pictures and much more information than in any flora, see Wayne P. Armstrong's Key To The Lemnaceae Of North America. We thank Wayne Armstrong for communicating this change to us, and for providing all the information in this note. Most of the time, the stem or infl height of this species is within the ranges given in these two floras of 30-90 cm (JM) or 30-80 cm (Munz). However, after a burn, the plants of this species can get much taller. James Dillane observed a significant fraction, on the order of 25%, of a large population of plants with heights of 180 to 200 cm. JM key and description, pp. 1225-1226. Something doesn't seem right in Achnatherum coronatum / A. parishii land. This note simply gives an alert that there seems to be a problem. I have begun to collect data in order to shed some light on it. See Achnatherum coronatum / A. parishii for comments.